Dan appeared on Good Morning America Monday, June 30th, to discuss the ongoing Oscar Pistorius trial, specifically, Pistorius’ recent psyche evaluation. 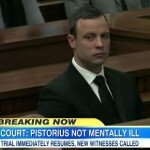 The “Blade Runner” underwent a psychiatric evaluation after a defense witnessed testified that the Olympic runner suffered from generalized anxiety disorder at the time he shot and killed his girlfriend, Reeva Steenkamp. Today in court, the results of his evaluation were released and a panel of experts have said that he was in fact, not mentally incapacitated when he shot and killed Steenkamp. What kind of impact will this have on his case? Says Dan, “Remember, the defense never claimed he was mentally incapacitated, and the prosecution never believed it. This was a strategic move by prosecutors to effectively say to the defense team, stop talking about his mental state. Don’t mention it. It’s not relevant in the context of the case.” Watch the full clip here.